As early as 7/12/63 we informed you that Dr. LEONARD GARTEN'S amended medical certificate of 7/1/63 is available to us. Dr. Garten indicates that in Germany you were treated for your bronchitis among other [places] in Bad Reichenhall. 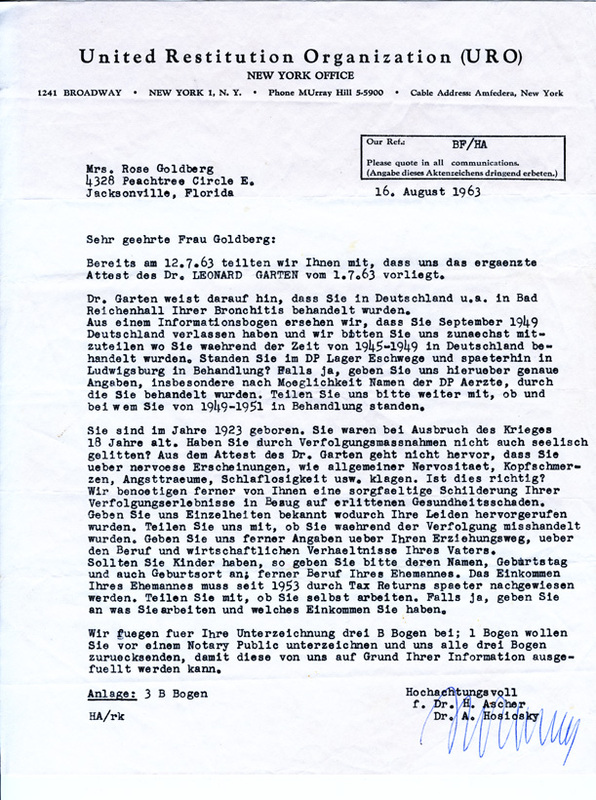 We see from an informational leaflet that you left Germany in September 1949, and we ask you to begin with to inform us where you were treated in Germany from 1945-1949. Were you being treated in the DP camp Eschwege and later in Ludwigsburg? If so, give us detailed information about this, especially names of the DP doctors by whom you were treated, if possible. Please inform us furthermore if you were in treatment from 1949-1951, and with whom. You were born in the year 1923. You were 18 years old at the outbreak of the war. Didn't you also suffer emotionally as a consequence of the persecution? It is not apparent from Dr. Garten's medical certificate that you complain of nervous occurrences such as general nervousness, headaches, nightmares, sleeplessness etc. Is this correct? We also need from you a careful narration of your experiences while you were persecuted, with regard to harm suffered to your health. Let us know details through which your ailments were brought about. Advise us whether you were mistreated during your persecution. Furthermore, give us information about your educational track and about your father's occupation and economic situation. Should you have children, please indicate their names, birthdays and also place of birth, and additionally your husband's occupation. Your husband's income will later have to be ascertained through tax returns from 1953 on. Inform us whether you yourself are working. If so, specify your income and what you do. We enclose for your signature three B sheets: 1 sheet you will want to sign in the presence of a notary public, and send all three sheets back to us, so that they can be filled out by us according to your information. 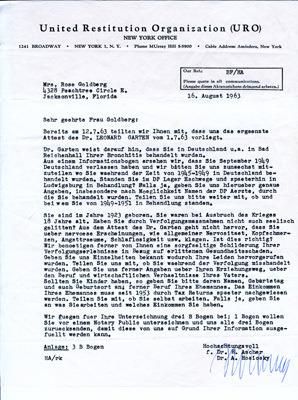 This August 16, 1963 letter from Dr. H. Ascher and Dr. A. Hosiosky of the United Restitution Organization asks Rosa detailed questions and gives her suggestions. A translation of this letter is to the right.